You have a lot of choices when selecting a floor removal company. Speedy Floor Removal is your number one choice for efficient, reliable, and cost effective floor removal. Not only do we remove your old floor with our state-of-the-art, virtually dustless removal system, we expertly prepare your subfloors for new installation. 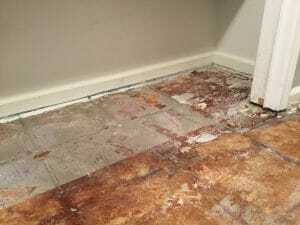 Speedy Floor Removal is your partner through the whole floor removal process. We have invested thousands of dollars in dustless sub-floor preparation equipment to keep your home or business dust-free. Did you know that just one square foot of floor removal can produce more than one pound of dust? Our state-of the-art machines suction dust and residue away as they work, making our floor removal process virtually dustless. Other companies try to mitigate dust with tape and plastic sheeting, but we know from experience that these methods do not adequately contain the copious amounts of potentially dangerous dust created by traditional floor removal processes. This is why our suction machines use HEPA Certified Air Cleaners to capture dust before it spreads around your home or business. It’s in our name! Our battery powered, emissions free machines can remove the floors from an entire house or building in just one day. Using Speedy Floor Removal to complete your floor removal project means the job will be done quickly and efficiently. Unlike handymen and other unspecialized contractors, we have the right equipment on hand to remove floors quickly. Removing old flooring and preparing subfloors for new installation is the only thing we do. We have spent years and thousands of dollars investing in doing it the right way. Our crew of insured and highly skilled experts are trained to meet the toughest quality standards and committed to customer satisfaction. Hiring the best professionals in the business is our top priority. We put the customer first and our crew treats your home with the care and respect it deserves. Our leadership, values, and highly skilled team are what set Speedy Floor Removal apart in an industry awash with unscrupulous fly-by-night businesses. Our team is not only highly skilled and proficient in using our industry-leading tools, but also extensively trained to protect your home and safely dispose of waste. The highly efficient Speedy Floor Removal system achieves a perfectly level, superior sub-floor, ready for new installation. Speedy knows floor removal is about so much more than just removing the existing flooring. Once the old flooring is removed, you are left with a variety of glues, residues, and other coatings from the previous flooring. Often several generations of flooring have used been in one area, leaving behind a whole time capsule of different adhesives! 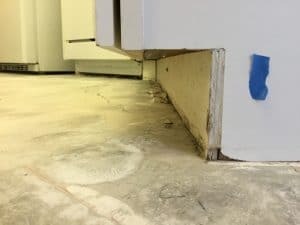 Placing new flooring on top of this mixture creates an uneven surface that looks bad, feels uneven underfoot, and seriously damage the new flooring over time. Removing the old floor is only one part of our process. 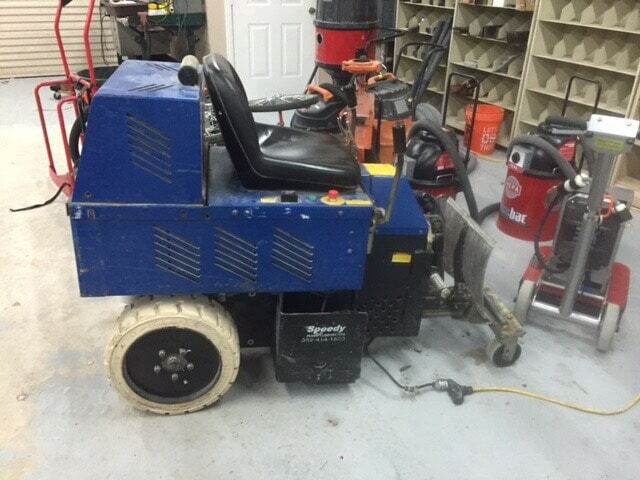 Our top-of-the-line grinders remove even the thinnest, most undetectable layers of sealant and adhesive, leaving your subfloor perfectly prepared for fresh, new flooring. Our professional crew and state-of-the-art machines complete a safer, cleaner, and more carefully executed floor removal project. You never know what is holding a floor down and removing old flooring can require a lot of force! Protecting your family, home, and belongings is a top priority for our entire crew. Every member of our team has been carefully trained in protecting your cabinets, furniture, walls, and other flooring. Our equipment is the most sophisticated in the business, specifically designed to easily enter and exit your home leaving no impact. Trust your home to the experts who care. The fast and efficient Speedy Floor Removal system creates a simpler clean-up and disposal process, which translates into big savings. Our state-of-the-art equipment uses built-in vacuum systems that remove dust as they work. Our team is specially trained to safely dispose of waste as it is collected. Other services use tape and plastic barriers to protect your home from dust and particles. We know this is not enough! Dust becomes insidious and settles everywhere around your home. Speedy Floor Removal combines traditional plastic barriers with cutting-edge suction equipment to ensure your floor removal process is virtually dust-free, meaning the rest of your home does not need deep-cleaning after the project is finished. Speedy Floor Removal professionals do the job right the first time—saving you time and money. Like any remodeling project, floor removal can come with lots of unexpected twists and turns. At Speedy, we know what to look for and assess the situation as soon as we enter your home. We endeavor to address and work with every unforeseen circumstance that comes our way, never leaving you high and dry with a half-finished project. Before starting the floor removal process, you have to buy new flooring to replace your current flooring. Purchasing new flooring for your home can be an intimidating process. There are several considerations you need to think about when making this decision. Here are the eight most important things, according to Speedy Floor Removal, to keep in mind before buying new flooring. Where is the room located? What is it used for? If the room is located where people will be coming and going from outside, you might want to think about hardwood flooring or tile because they are easier to clean and maintain. If you will be standing for a long period of time in that room, you may want to go a different direction other than tile, due to how uncomfortable it can be to stand on tile flooring for long periods of time. Before choosing your new flooring, you should consider where you live and the climate. Wood can warp and buckle and carpet can mold in humid environments. In Florida, the best types of flooring for the climate are tile or laminate flooring. Engineered hardwood flooring is designed to better withstand the climate of Florida. Not only will you want to think about what colors, patterns, and textures appeal the most to you, but you’ll also want to think about what compliments your current decor. If you won’t be redecorating afterward, you will probably want to choose a flooring that coordinates with your current furniture and accessories in the room. Different flooring requires different maintenance. You will need to factor in what kind of upkeep and cleaning. Will you need to refinish the flooring later? Will it require steaming? You will need to determine how much time you will have for the required upkeep before making a decision. If you or someone in your home has allergies, carpet flooring may not be the best option for you. Carpet can accumulate allergens like dust mites, pet dander, mold spores, and other potentially aggravating proteins. Tile and hardwood flooring collects fewer dust mites and allergens. If you will be installing the new flooring yourself, you will need to know how to install the flooring you buy. If you choose to do the installation yourself, you will need to make sure you can identify and repair a faulty subfloor and know how to safely dispose of the old flooring. Some flooring may require professional removal. Speedy Floor Removal can assist you in the floor removal process through our Speedy Assist program. Speedy Assist will provide you with industry-leading equipment and a highly trained expert so that you can get the job done quickly and efficiently! If you currently have hardwood flooring, don’t be so hasty to rip them out before doing your research on your refinishing options. You may be able to preserve it with a new stain. Refinishing your current hardwood flooring can restore the wood’s original appearance and shine. You can even change its color or finish. Not only do you have to think about the cost of the new flooring you choose, but you also have to think about the cost of underlayment, delivery, and installation, as well as additional materials such as baseboards, stains, or adhesive. You should also factor in removal and disposal of your previous flooring. Speedy Floor Removal removes all types of flooring and coverings, such as carpet, tile, and hardwood flooring for industrial, commercial, and residential facilities. We will prepare your surface by removing any epoxy, glue, oils, dust, and more in order for your flooring to look its best. We also will safely dispose of your old flooring when we are finished. Contact Speedy Floor Removal today to get a free quote for your next project. Hardwood flooring is becoming more popular in modern day homes, but carpet isn’t going out of fashion either. When making a flooring decision for your new home or home renovation project, there are several things to consider. Having carpet in your home not only keeps your feet warm, but it is also soft. There is nothing better than the feeling of carpet in the winter time. The variety of types of carpet are endless, allowing you to find the perfect match for your home. Carpet allows some flexibility in looks. There are carpet types for every occasion, whether you want a formal look in your home or a more casual feel. It is also generally a cheaper option compared to wood and ceramic. If you are remodeling on a budget, this is a great choice. If your family stomps around the house, carpet may be perfect for you as it can provide noise insulation. No more being disturbed by the pounding of feet on the ground. Carpet will absorb all the sound to create a quiet atmosphere. When it comes to carpet, maintenance isn’t as easy as other types of flooring. It can easily become stained from a single spill, taking a deep cleaning to get out. Spills can also lead to odor, even after the stain has been removed. Professional cleaning is an option to get tough stains and smells out, but it will cost you a pretty penny. Carpet also isn’t as long-lasting as most flooring options. If it is well maintained with frequent vacuuming and steam cleaned once a year, you can extend its life a little longer. However, good upkeep can’t save carpet from general wear and tear such as mats or seams showing. Dust mites, allergens, and moisture can hide deep within your carpet and not be picked up by your vacuum. Allergens trapped in carpet are especially troubling for families with small children. If you or someone in your household has severe allergies, this may not be the ideal flooring for you. Hardwood flooring is a great way to make a room look clean and simple. With a wide variety of options, hardwood flooring makes it easy to find the right kind and price for you. And if you want to spice it up later, you can put a fun rug down. If you have allergies, hardwood flooring is a great option. Unlike carpet, hardwood gives allergens no place to hide. Simply cleaning your floors will get rid of any allergens. Cleaning hardwood floors is much easier than cleaning carpet. However, they do need to be cleaned more often. You want to make sure to sweep or vacuum and mop them every week or so. They will last a lifetime if well taken care of. Buying and installing hardwood flooring is a hefty upfront investment compared to other flooring options. Hardwood will need to be refinished from time to time in order to keep it looking fresh. Unlike carpet, hard surface floors make every little sound detectable. You’ll be able to hear kids, pets, and anyone else in the house walking around. In the winter, hardwood flooring can be cold on your feet. However, an easy fix can be wearing socks or putting down a rug. When deciding between carpet and hardwood flooring, you also need to take your lifestyle into account. Do you have children? Are your pets potty-trained? What is your budget? These answers, along with all of the information above, will allow you to make an informed decision on your brand new flooring. If you are planning a home renovation project, let the professionals of Speedy Floor Removal help you. We can remove your flooring safely and quickly. To learn more about our floor removal service, contact us today! Are you vacuuming once a week and scrubbing your carpet with DIY floor cleaners and still not seeing a difference? Carpet can be a hassle to keep up with, especially with kids or animals in the house. The floor removal experts at Speedy Floor Removal has compiled three reasons you may think about removing your carpet. Accidents happen in life. People spill drinks, track in dirt with their shoes, drop food on the floor, and so on. Unfortunately, if any of this happens on carpet flooring, you will have a hard time getting the stains out. Even dirt is hard to get out of carpets. Small dirt particles tend to hide deep in the carpet’s fibers which can only be reached by professional cleaning tools. However, even with a professional’s help, there will always be some areas that just can’t be reached. Carpet is like a magnet for dust mites, pet dander, dead skin particles, mold, and other allergens that may provoke allergic reactions. Carpet fibers then trap these allergens in hard to reach places that are hard to clean. For households with small children, this can be a big issue as children’s immune systems are more sensitive. Check out this blog post to learn more about the dangers of dust inhalation and how we use state of the art equipment to capture dust when removing your floors. Carpet has a shorter lifespan than most other types of flooring. It should be replaced approximately every eight to ten years. With proper maintenance, you may be able to extend the life of your carpet, but it will still need to be replaced at some point in time. You will know when it is time to replace it by the appearance, and sometimes even the smell. To learn more about our floor removal services, contact us today! There is a reason why many homeowners put tile in kitchens and bathrooms; it’s because it’s easy to clean! Tile flooring in a Florida beach home is no exception to this rule. While tile typically isn’t found in living areas of the home, many flooring companies offer tile in a variety of styles and colors and often doesn’t look like traditional tile found in baths. Concrete flooring has become a huge trend in the last few years. Giving many homes an industrial look, concrete is durable and can withstand just about anything. Some flooring companies are now offering dying and coloring techniques where you can change the color from the dark, industrial look to a modern, one of kind colored or textured finish. Concrete flooring is easy to clean and maintain which is perfect for coastal properties. One disadvantage with concrete flooring is how hard the floor is. However, with area rugs and a frequent vaccum, concrete can be a durable flooring perfect for a coastal home. If you’re replacing your flooring in your beach home, contact the experts at Speedy Floor Removal. Our team can help you update your home with modern flooring by taking care of the hardest part–the floor removal! Contact our team today for a floor removal quote.